Welcome To My New Format! Hi. I'm known as Astroman on the message boards and as Steve Dodder in "real life". I'm giving this new format a shot. Hopefully, it'll be easier to navigate for you and easier to maintain for me. I've split the site up a bit into major categories. Clicking on one takes you to the old page until I can update all the formats. Some categories don't really fit into a main idea, so they're by themselves. The categories are mostly general, except What's in the Sky and tutorials, since these are relatively popular pages. Astronomy encompasses a LOT of ground, so this one is split up inside. The personal pages include other aspects of my life, including my wife, my other hobbies and my political views. Tesla coils is split off because it's my other main passion, though I don't find the time for it except in fits and starts. The site is in disarray, but I'm workin' on it. If there's something specific you'd like me to fix, just email me or sign the guest book. Cheers! 3/10/09 - A hacker attack took down the server for this website yesterday. I'm working on restoring it. 08/08/07-did some more updating of pages, strongly considering whacking the old site and installing this new one-however flawed. Site is LIVE, but I forget when I launched it. 12/3/07-Added a new page on the Binocular Chair. Check it out! 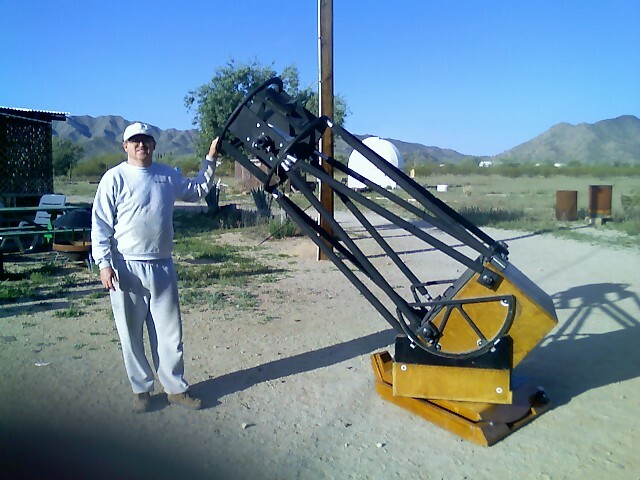 1/14/08-Rosie and I have agreed to host and coordinate the North Rim contingent of the Grand Canyon Star Party! We have a very limited number of camp sites available for free to volunteers that agree to stay the entire week and set up a scope for the public each night. Details by emailing me, and/or visiting the link. 3/26/08 picture of the "new" scope-a 20" F/4.3 I'll be purchasing. Will definitely come in handy at the GCSP! Copyright you.com. All Rights Reserved • Dreamweaver-Templates.org.